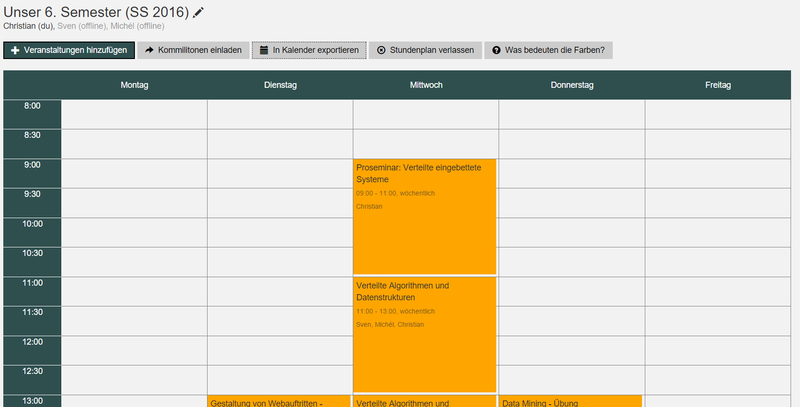 PAULa is a planning tool for students of the University of Paderborn developed by two fellow students and myself. It allows them to simulate what their timetable could look like in the next semester without actually selecting courses in the official university system “PAUL”. Its main advantage is that the whole semester is displayed compressed into one week. Recurring events are shown with their frequency and overlapping events are highlighted, making it easy to select a set of courses and tutorials without clashes. PAULa even allows live-collaboration with classmates. Additionally, it is possible to subscribe to the resulting calendar in Google Calendar, Outlook, et cetera. PAULa is a web-app implemented using technologies like .NET Core on Linux inside a Docker container, Angular.JS and Bootstrap. In 2017, it has won the Innoversity award of the University of Paderborn. I'm a freelancing Computer Science student from Germany with a lot of experience in Android development. Interested? I'd love to work on your upcoming project. Don't hesitate to contact me.